This DeWalt jigsaw normally retails at around £365. At Amazon UK right now there is an amazing 70% discount. That slashes the price down to around £106, making this extremely high quality product, a great deal. It is however worth noticing that this is a "tool only" offer. It does not come with a battery. Therefore you will have to buy one to make this work. If however, you have an existing Dewalt battery, then this deal makes a great deal of sense. 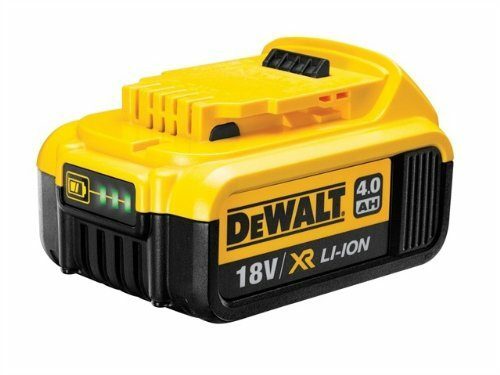 The battery required to make this one work is the standard Dewalt ​18V XR Lithium-Ion Battery, which costs around £50-55, depending on where you make your purchase. Do, if you bought this bare tool, and the battery, your total outlay would be around £160. For that you would own the best cordless jigsaw that there is to be bought. ​There have been plenty of buyers for this jigsaw. It really is no big surprise as Dewalt is the choice of professionals. This saw has an amazing 4.9 out of 5 star rating. It doesn't get much better than that. If you have the time to watch the 2 minute video below, it gives a very good explanation of the product. Braked System - As soon as you let go of the trigger the jigsaw stops. With other makes and models you normally have to wait until the blades comes to a slow stop. ​Bevel Adjustments - the saw is clearly marked and easy to adjust the sole plate for a nice angled cut. Dust Blower - This can be adjusted to blow any sawdust away from the work area. Keyless Blade Change - super simple to change the blades with this one. ​Many buyers also commented on the cutting angle of blade and foot plate. This allows for a huge amount of projects to be undertaken with this tool. All buyers agreed that it is well balanced and a real pleasure to use.